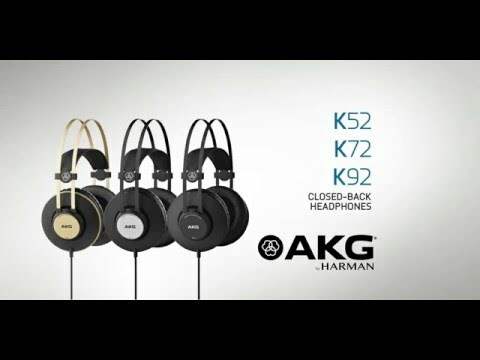 For exceptional sound at home, in the studio or on the road the AKG K52 Closed Back Headphones represent unbelievable value for money. The comfortable and durable design houses the powerful drivers so that you capture all of the audio without bothering the outside world. The beauty of the AKG K52's is that the closed back design helps eliminate any sound spillage. This is very useful in a studio environment when the singer may need a click track and you don't want the audio from the click to spill into the recording. On the flip side of the coin, the wearer will get great isolation for outside audio which can be a big bonus for live engineers. Underneath the closed back of the K52's resides a large 40mm driver capable of a full 18 to 2000Hz range. No part of the music will be missed out, you'll hear rich basses, punchy mid-range and shimmering treble all without any sort of exaggeration - in short, pure and clear sound. AKG are renowned for making world class headphones that not only incorporate superior sound technology but also a level of comfort that can guarantee fatigue-free studio sessions. The headband is fully exposed and will naturally fit to your head to support the 200g weight. This coupled with the plush earpads means you may forget that you're wearing the K52's at all. The AKG K52 Closed Back Headphones are powerful enough to be considered by professionals whilst being priced so that anyone can hear the astounding clarity AKG deliver. Whether using them in the studio or just enjoying your sound out and about, the AKG K52's are an excellent purchase.